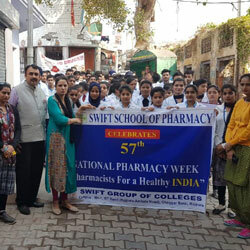 Swift School of Pharmacy, Rajpura, celebrated 57th National Pharmacy Week under the theme Pharmacists for a Healthy India at its Campus. Students of B. Pharmacy & M. Pharmacy participated in various activities including Rangoli, Poster / Collage making, Slogan writing, debate and Quiz organized related to the theme. On the first day, a rally was organized in Ghanaur constituency with a motive of DRUG FREE PUNJAB. Students of Pharmacy College walked through the streets and markets raising slogans against drug abuse. Dr. G. Munjal, President, Swift Group of Colleges presided over the function. While congratulating & motivating the students, Dr. Munjal said that we have to divert the mind of youth from drugs towards other recreational activities. He appealed all the students to join this campaign to make Punjab drug free. Dr. Maninder, Asstt. Director SGOC, Mr. Anshu Gupta and Nadeem Khan were also present among others on the occasion. In the series of the celebrations, a guest lecture was organized to mark the occasion. Dr. A.K. Tiwary, Professor & Ex Head, Department of Pharm. Sci. 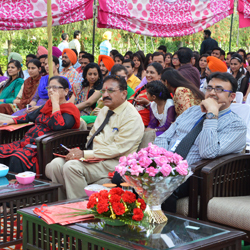 and Drug Research, Punjabi University, Patiala was the Guest of Honor for the occasion. Dr. Tiwary, enlightened the students about the various careers that can be opted in the field of Pharmacy and scope of Pharmacy in the future. Dr. Tiwary further added that as care providers, pharmacists have achieved tremendous success in their goals to improve quality of patient life. A fresher party, Aaghaaz -2017, was organized at Swift School of Pharmacy, Rajpura to welcome the newly admitted students for the session 2017-18. Dr. G. Munjal, President, Dr. Maninder Mehmi, Asstt. Director and Dr. A.M.J. Newton, Principal of the college welcome the newest members in the college. 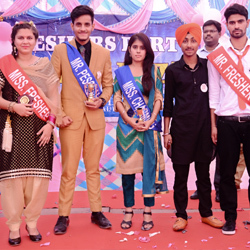 The students organized various activities like dancing singing, skit and games for the young fresher’s. All the students give their best performance which was applauded by the members present in the party. Ms. Shiwali and Mr. Gaurov were accorded the title of "Ms. Fresher" and "Mr. Fresher". Mr. Girish won the "Mr. Personality" and Ms. Pinky won the "Ms. Charming" Title. On the occasion Dr. G. Munjal, President, Swift Group of College address the young fresher’s to work hard and achieve the best in their career. . Swift School of Pharmacy organized farewell party for students of session 2016-17. To bid adieu, juniors performed, sang and danced on the beats. Various games were also organized to exhilarate students. Mementoes were bestowed upon the winners in various categories. Principal of the school and all the staff members graced the occasion and wished good luck to the passing batch. Best Personality award was backed by Mr. Vineet Dhayia and Ms. Nidhi got the Ms. Charming award.